PROLITE can fabricate virtually any piping product, tank or plastic structure to your specific requirements in a variety of materials including PVC, CPVC, HDPE, PP, PVDF and ECTFE. – Polyvinyl chloride (PVC) and Chlorinated polyvinyl chloride (CPVC) piping and fittings available in IPS and Metric sizes. – Ductile Iron, Carbon Steel, Stainless Steel and PP coated steel flange backing rings for thermoplastic, dual laminate and FRP piping systems. 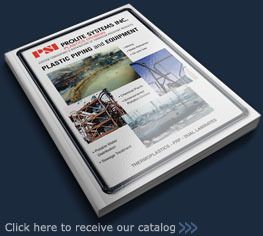 PROLITE is an authorized Canadian and International distributor for IPP Improved Piping Products backing rings. – HDPE, PP, PVDF and ECTFE Agru SureGrip concrete protective liners. PROLITE will supply, design and install liners for the protection of concrete against multiple acids. Prolite has Polyolefin pipe fusion welding machines for ½” to 63″ diameters. PROLITE is an authorized Canadian and international sales and service distributor for CONNECTRA Fusion Technologies.